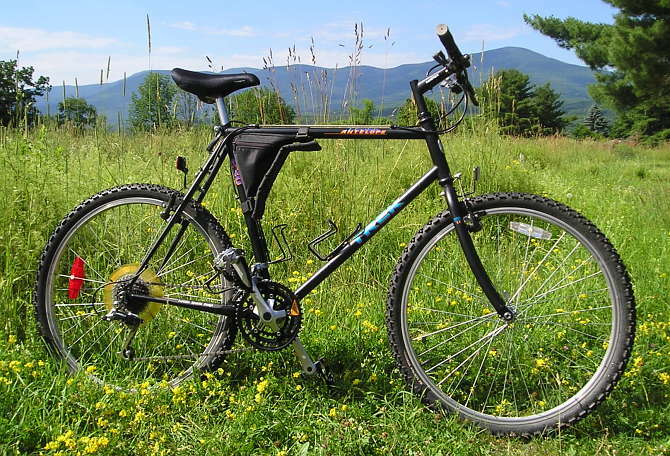 I wasn't looking for a Mountain Bike but when I saw this one in the "Free" listings on craigslist, 5 minutes after it posted, I couldn't pass it up. I'm glad I didn't. It was a 45 minute drive to collect this free bike. 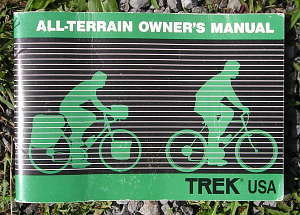 The previous owner rolled it out on flat tires and said he had included the original manual in the frame bag. When I got it home, I inflated the tires and was pleased to find that it was exactly my size. 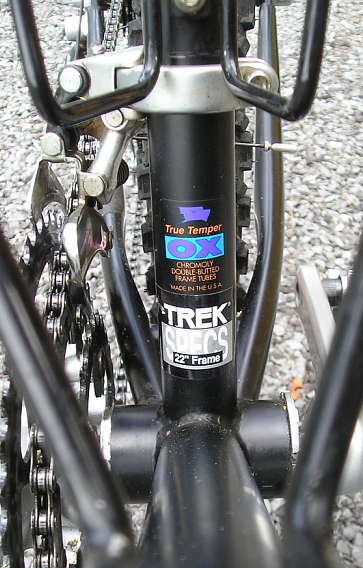 This 21-speed Trek Antelope bicycle was made in Taiwan in 1991 for the '92 model year*. 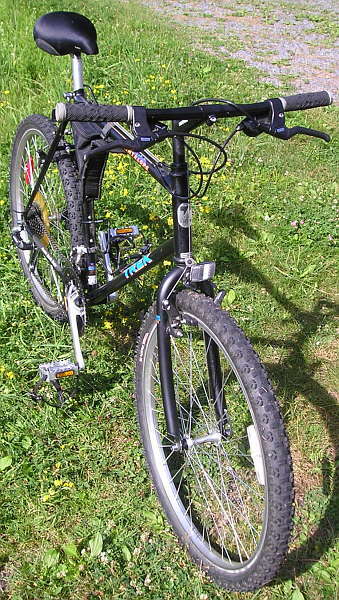 When I got it, neither shifter was working and it had a worn, elongated chain but it was in very good condition otherwise. The left shifter was just gummed up with old oil and after a liberal spray of WD-40 on its working parts, they loosened up and worked fine. The right shifter was missing its housing and had a broken ratchet spring. I bent a new one out of the cut-off end of a guitar G-string and had it working in no time. It still doesn't have a housing but that's mostly a cosmetic thing. 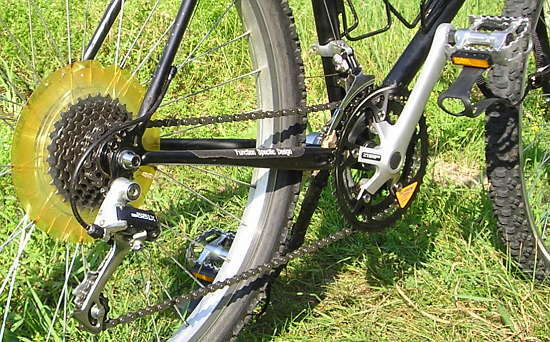 I replaced the worn-out chain with a new one I had on hand and easily put a stop to the skipping problem it had. The bearings were all in very good condition. They must have had some maintenance at some point. I cleaned and repacked them. I was surprised to find caged bearings in the bottom bracket. That used to be the mark of an ultra-cheap bike. The Antelope is not the best quality bicycle but it does have double-butted Cro-Moly frame tubes. I would have expected to see loose bearings, especially in a Mountain Bike where an extra ball bearing or two per side would mean more durability. After adjusting the shifter and brake cables, I took it for a shakedown cruise to work. The commute took a little longer than usual. It definitely doesn't behave like a road bike but I did appreciate the lower gearing on the steeper hills. I had to chuckle at the automotive "snow tire" sound the knobby tires made on the road as the bike accelerated. Keep in mind, this is the first MTB I've ever ridden. The Antelope performed so well on the commute that I'm planning to put some road tires on it and change the cassette to a slightly higher geared one. I may also add some bar ends, as well as a rack and maybe fenders. I'll add pictures to this page if I do these things (Update 8/12/08: It got its own page). I have no way of knowing if all of the parts on this bike are original. 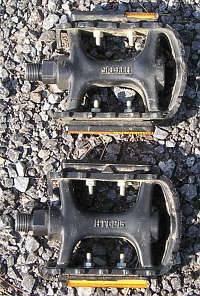 The pictures show it after I changed the beat up plastic pedals to alloy ones. The rear wheel reflector was missing but I assume it was white like the front one. I'm also assuming the bottle cages and frame bag are aftermarket. *The serial number of this Antelope indicates it was made in 1991. 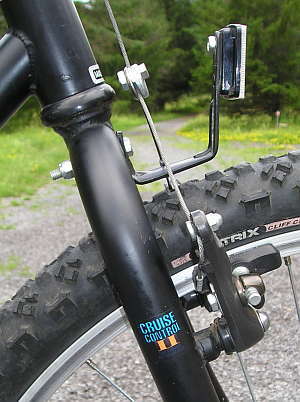 It has the color scheme believed to be from the 1992 model year, however the components are those listed in the '91 catalog, not the '92 so there is the possiblity that it is a late 1991 model.